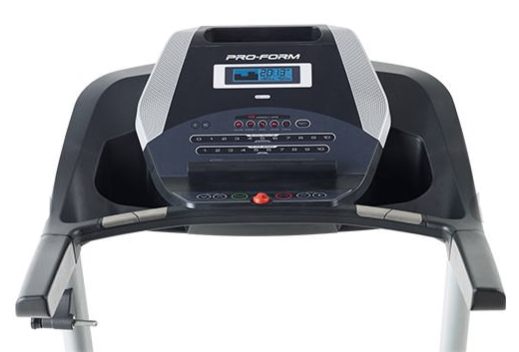 If you are looking for an affordable treadmill that comes with incredible features to suit a serious runner, you need to get yourself ProForm 505 CST Treadmill. It comes with a promise if satisfaction. It is specially designed with outstanding features meant to give a runner maximum comfort and enjoyment as they perform their treading activities. What are The Features of ProForm 505 CST? Your treading sessions can never be excellent when your treadmill doesn’t have a powerful motor. This ProForm machine is featured with a strong 2.5 CHP electromagnetic DC motor that has been proven to be efficient in performing its job. One thing that you will love about this 2.5 CHP Mach Z™ Commercial motor is that is operates quietly and smoothly even during tough workout sessions. More to that its quiet operation won’t cut short your TV or MP3 device entertainment. To prove the motor’s durability, ProForm provides a 25 year warranty for it. The motor size of this treadmill is able to support 10 MPH speed. 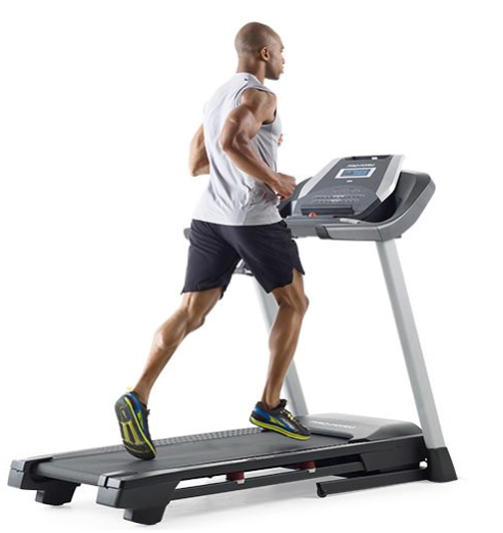 If you are an average runner training to launch into running for high speeds this treadmill will be perfect for you. 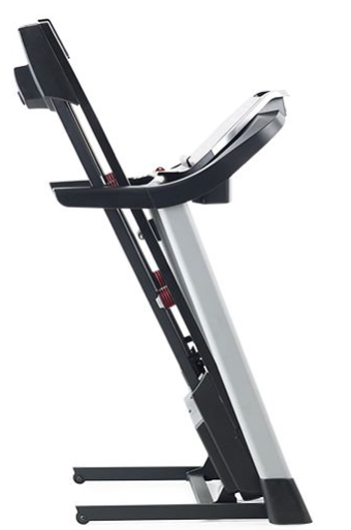 If you are a runner that wants to give yourself the uphill routes challenge you need to get this treading machine that comes with a 0-10% incline for tough training sessions. With this feature you will be able to run on steep-hill routes to give your legs a bigger exercising task. More to that with this kind of incline you will be able to lose calories at an alarming rate. Running through several options to change speed or incline can be quite inconveniencing. To ensure that you don’t encounter this inconveniences this machine is featured with quick buttons by which you will be able to change your speed and incline very comfortably. If you are looking for a treadmill that will not move on and about as you exercise this compact ProForm 505 CST treadmill is what you need. All its parts are strongly fixed together to ensure that they stay put even when you are on high intensity workouts. If you want a treading machine that will give you super comfort on your legs, joints and hips; the ProForm 505 CST treadmill is what you need. It comes with a properly cushioned deck named ProShox Cushioning to ensure that your feet and joint don’t suffer stress while you run or jog on the treadmill desk. Moreover, the deck is quite comfortable for people that have had previous injuries such that they can be able to keep fit without reviving the past injuries. With comfortable cushioning on the deck you will absolutely have sufficient motivation to keep treading for longer hours to attain your health goals. Do you want your workout sessions to be smooth and quiet? This treading equipment will be super ideal for you. It is featured with 1.9 inch rollers that reduce tension on the running belt hence enhancing a smooth operation of the belt when you are running or jogging. These rollers also prevent this machine from tear and wear thus increasing its durability. Though the treadmill is small in size you can be pretty sure that you won’t hear the slightest noise from the operation of the treading belt. Want a treadmill that can accommodate the weight of most users? This is the most ideal machine for you It comes with a maximum running surface capacity of 325 pounds. This amazing treadmill is featured with a powerful frame meant to withstand workouts of all intensities starting from a 10MPH speed to a 10% level incline. Are you an average user looking for a treadmill that can accommodate your height? You need to get yourself this amazing treadmill that comes with a 20×55 inches long running belt. With this long belt every average user will be able to run on the running surface making long comfortable strides without facing the fear of falling off the belt. With plenty or running space you can be sure that you won’t strain your legs and feet hence your workout sessions will be more productive. As an assurance of high quality this belt is tried for one million progressions at twice the user weight. You don’t want a treadmill that will consume your entire floor space. This equipment is featured with a space saving design that enables you to fold it easily when you are done with your workout sessions. With this feature you can be sure that you won’t have to wait until you get yourself a bigger house where you can conveniently store a treadmill. Additionally, the deck itself is compact and small in size which is another plus for a runner who has a limited storage for the equipment. Accessing your workout data as you exercise will enable you to know whether you are doing a workout that is enough to achieve your fitness goals. With this treadmill you will get to enjoy a super clear 6-inch screen that will enable you to access your workout data very conveniently. It provides you with information on time, speed, incline, distance covered, calorie burn, and heart rate. Want a treadmill that comes with all the supportive features to see you achieve your fitness goals faster? This equipment will be perfect for you. It comes with 18 workout programs designed by a professional trainer to help you in attaining your targeted health goals. With these programs you will be able to achieve your goals on weight loss, calorie burn and muscle nourishment. If you are subscribed to iFit you will be able to access more workout programs that don’t come with the ProForm treadmill. In addition, the treadmill is designed in a way to adjust its incline and speed depending on the workout program that you choose for your treading sessions. Are you couples that are looking forward to achieve your fitness goals together? This treadmill will be best for you since it is featured with 2-user modules that can be used by two people. With this feature you will be able to walk through the fitness journey as a family. You don’t want to run on a deck that is placed on an incline position because it may be quite tedious. Unlike some other treadmills that come with a deck on an inline position, this machine comes with a flat treadmill that allows you to warm up before you pick up to a higher speed or incline. Model from 2014 comes with the iFit compatibility. With iFit technology you will be able to customize your fitness programs, access workouts with Jillian Michaels, enjoy plenty of workout programs, access Google map routes and also keep track of your workout profile. Note: iFit doesn’t work without internet connection. Unfortunately 2015 model is not compatible with the iFit app. Staying entertained during your workout sessions will absolutely boost your workout morale. This machine is designed with a music port to enable you connect your MP3 device and listen to your favorite music during your training sessions. The port is placed conveniently on the console to ensure that you fix your MP3 device quite easily. More to that, you will get to enjoy rich sound from the 2 inbuilt speakersthat come with this treadmill such that you won’t have to use the ear phones to enjoy a clear sound. What more could you ask for when you can have your music on as you sweat it out on your treadmill? Tracking your heart rate will enable you to evaluate whether your workout intensity is sufficient to help you attain your fitness goals. This treadmill comes with two handgrip sensors placed on the handle bars that get to accurately monitor your heart rate. With the handgrip sensors you will be able to keep track of your heart rate quite effortlessly. Are you the kind of person that wants to stay fit but still can’t be separated from the love of reading books? You need to get yourself this amazing fitness machine that comes with a reading racket to meet your reading needs effectively. When reading your favorite books and novels as you run you can be pretty sure that you will be motivated to engage in endurance training without getting overly exhausted. Dehydration can cause you to underperform during your training sessions. This treadmill comes with the bottle holder feature to take care of your refreshment needs effectively. With this feature you will be able to carry along water or any of your favorite drinks to keep you revitalized as you work out to attain a fit body. If you are aspiring to begin on treading sessions but you have a limited amount of cash you don’t have to worry. This amazing treadmill comes with a customer friendly price that is below $600 to suit your frugal budget. With this favorable price you will get to enjoy amazing features to suit your workout sessions. Customers that have used this product already are happy about it and they can attest that you get to enjoy most features that are found in treadmills that are more costly. Assembling this ProForm 505 Treadmill will take you about two or more hours if you are doing it all alone; with a second hand to assist you it can take a shorter while. Nevertheless if you understand the assembling instructions clearly it won’t cost you much of your effort. Most of the parts are parked separately and with the provided assembling tools and the manual you will be able to put them together and get to work immediately. This ProForm treadmill comes with a very customer-friendly warranty: lifetime warranty for frame, 25 years for the motor and 1 year on the parts. Once you have no doubts that this is the machine you need you will have two options; buying the product directly from the manufacturer or buying it form theAmazon site. Buying this treadmill form the Amazon site will enable you to enjoy a great price, fast and free (prime line member) shipping and an exceptional customer service. If you purchase it directly from the manufacturer you will be assured of free shipping, amazing customer service and a customer-friendly price. Are you in search of an affordable treadmill to suit your home workout needs? With ProForm 505 CST Treadmill Review given above you are definitely convinced that this is the machine that you need. It comes with all the comfort and efficiency that you will find in other bigger treadmills and also an outstanding customer warranty. More to that, you will get to experience a quiet and steady operation that is a great requirement of any treadmill that is impressive to a runner. Get it today at a very fair price and begin to enjoy satisfactory workout sessions.